Brass insert fittings and rings are manufactured and certified to the requirements of ASTM F1807. All fittings and rings are marked with the F 1807 designation, PEX manufacturers mark, and required mark(s) of third party certification organizations. Fittings meet the requirements of ANSI/NSF 61 for health effects and are suitable for contact with potable water. NSF International and other certification organizations conduct random on-site inspections of manufacturing facilities and independently test fittings for compliance with physical, performance and toxicological specifications. Brass Insert Fittings and black copper crimp rings can be used as connections for CANPEX™ and CANPEX™ ULTRA tubing in 3/8″, 1/2″, 3/4″, and 1″ sizes. The connections are assembled with a full-circle crimp tool designed specifically for that purpose. A permanent, sealed connection is made when a copper crimp ring is compressed around the tubing, pressing the PEX into spaces between the ribs of the insert fitting. A wide range of fittings is available to make connections, reductions or transitions to PEX tubing, fixtures, or other piping material. The line also features a complete selection of ball and stop valves. 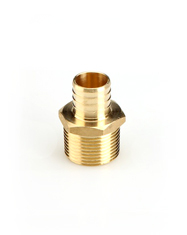 Brass Insert Fittings are manufactured from standard or lead-free extruded or forged brass with some fittings supplied in copper. All Brass Insert Fittings are precision made to tight tolerances for a consistent fit with CANPEX pipe. The black, copper crimp rings are manufactured from UNS C102200 copper alloy. Rings are annealed to 35-45 Rockwell 15T scale for ease of crimping. The black coating is not a paint but a surface treatment which does not add to the dimensions of the ring. Brass Insert Fittings and rings are manufactured and certified to the requirements of ASTM F1807 to insure compatibility with all SDR9 PEX tubing and fitting components from numerous manufacturers. Metallic Brass Insert Fittings are designed to be used with CANPEX series PEX tubing for hot and cold water conveyance systems operating up to 100 psi @ 180°F and 160 psi @ 73°F. Applications include, but are not limited to potable water distribution and hydronic heating systems. Brass Insert Fittings system components are interchangeable with components and tubing from other PEX suppliers provided they are manufactured to the same ASTM specifications and the manufacturer approves the mixing of components. Because CB Supplies has no control over the quality of other manufacturers, it does not extend any warranty to those components that are not supplied by CB Supplies. For information on other hot and cold applications not listed here, consult with your CB Supplies representative.